THE B-MOVIE NEWS VAULT: STOCK YOUR VAULT: New DVDs & Blu-rays for 05/23/2017! STOCK YOUR VAULT: New DVDs & Blu-rays for 05/23/2017! Greetings Vault Dwellers! Memorial Day weekend is nearly here and it looks like all of our fave genre distribution labels are taking some time off, because this week's release slate is pretty sparse. 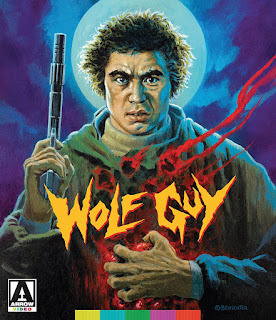 Scream Factory gives THE VAGRANT (featuring the late and great Bill Paxton) its Blu-ray debut, Kino Lorber resurrects THE FUNNY FARM in high-definition, and Arrow Video gives us an awesome double blast of Asian cinema with COPS VS. THUGS and WOLF GUY (which has never before been released in North America)! For those of you looking for Blockbuster thrills, this week also saw the release of LOGAN, THE GREAT WALL, and GET OUT! There's a handful of other titles on DVD & Blu-ray that you can pick up for your collections this week. Just scroll down a tad to see them!